The closing ceremony of the Training Course for Promoting Stable Employment of Foreign Residents in FY2015, Shinjuku course was held. 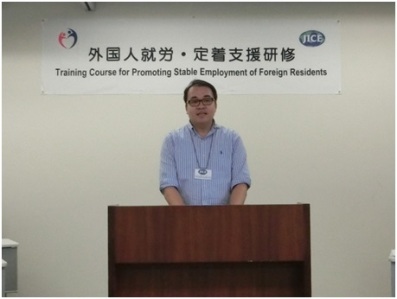 On September 8, the closing ceremony of the Training Course for Promoting Stable Employment of Foreign Residents was held at JICE headquarters. 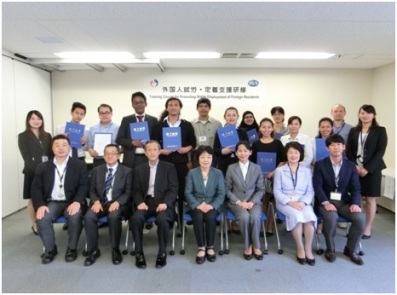 At the ceremony, with the attendance of Mr. Namihiro AKAO, Assistant Section Chief of the Employment Measures Section, Employment Security Department of Tokyo Labour Bureau, 12 participants were given the certificate of completion from Ms. Sachiko YAMANO, the president of JICE. Participants gave speeches. They made remarks on the training course and announced their new goals. JICE implements the training course for foreign residents who need to find a job. The aim of training course is to improve Japanese communication skills and acquire knowledge such as labor-related laws and regulations and common practices at work. Participants also learn how to make resume and how to read job opening information. 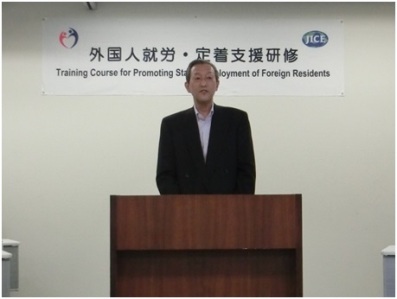 JICE will continue to offer the training course for more foreign residents who want to get stable jobs. Measures Section, Tokyo Labour Bureau. Ms. Akiko MIZUNO, Japanese Teacher, Mr. Namihiro AKAO, Assistant Section Chief of the Employment Measures Section, Tokyo Labour Bureau, Mr. Aiichiro YAMAMOTO, Specially Appointed Director of General Affairs Division, Tokyo Labour Bureau, Mr. Jun YOSHIMURA, Chief of Social Integration Division.